EkoCore from Andrew J. Schuman on Vimeo. I’ve long been a fan of digital stethoscopes, in part because they improve my ability to auscultate lung and heart sounds, but also because they advance the iconic device that has been associated with medical practice for centuries. To be fair my hearing is much poorer now that I’m in my third decade of medical practice, and my Bluetooth hearing aids help enormously. For some reason very few of my colleagues have moved beyond their acoustic stethoscope and adopted digital devices. I can tell you that digital stethoscopes vastly improve my diagnostic capabilities when it comes to subtle pneumonias and I find I need to order fewer x-rays than other pediatricians. I can also hear murmurs more clearly as well. The Eko Core Stethoscope system includes the Eko Core Attachment and a capable two headed stethoscope system. It integrates a lithium battery that charges via a microusb port that powers the device for up to 9 hours. When not turned on the stethoscope functions as a typical acoustic (ie analog) stethoscope. When turned on the device amplifies auscultated sounds up to 40 times. While it does not have ambient noise reduction, unlike some of its competitors, the sound quality is very good and switching between the two modes allows you to appreciate the difference between acoustic and digital amplified modes. 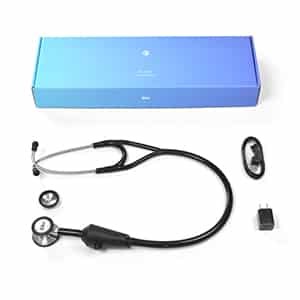 While you can purchase the Eko Core Stethoscope System for $299, you can purchase the Core Attachment for just $199 and attach your own stethoscope headset, tubing and stethoscope head to the device. Eko health states that the Core Attachment is compatible with most stethoscopes currently on the market. The Eko Core Attachment/Stethoscope system integrates Bluetooth connectivity to allow recording of auscultated sounds via the Eko application on IOS or Android devices. Thus one can record auscultated lungs sounds or murmurs. Auscultated heart sounds are displayed as a phonocardiogram via the application. In the near future Ekohealth will introduce its Duo system with combines a digital stethoscope with a one lead EKG – stay tuned!